All of a sudden, there were Flash Tattoos....jewelry inspired tattoos that are bright, bold, on trend and easy to obsess over. After drooling over their social media feeds (they were featured as an accessory during last week's MBFW for L*Space Swimwear by Monica Wise) and seeing them written about in articles in Lucky Magazine, Vogue.com, Huffington Post Style and Rue La La, I finally caved in and ordered a set for myself today! As I am waiting for the arrival of the Sheebani collection, I wanted to share them with all of you. Just take a look at their site Flash Tattoos and instagram feed @flashtattoos to see what I am talking about. I bet you'll want to try them on, too! Transform your entire look... in a Flash! 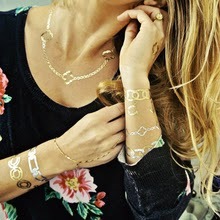 Flash Tattoos - innovative jewelry inspired temporary tattoos for serious (and not so serious) fashionistas. Flash Tattoos are perfect for the beach, the pool, parties, festivals, concerts... anywhere you and your skin might be seen having fun. Just apply, glimmer and go! Your Flash Tattoo will last about 4-6 days depending on where they are placed and how well you take care of them. To care for your Flash avoid any soap, sunscreen, lotions or oils near or on your tattoo. These types of oil based substances will begin to degrade the adhesive. Each Flash Tattoo collection is unique, includes 3-4 sheets of various metallic designs, and plenty of Flash to share with friends. Have fun creating your own necklaces and designs. Get Flashy! You will be amazed by how quick and easy it is to apply your Flash Tattoo with the help of a little water. For best application, ask a friend to help position your Flash Tattoo so your skin does not twist or stretch. You want to make sure your skin is clean, dry and free of any oils or the tattoo will not adhere. Cut out the tattoo as close to the edge as possible (this is important later when you need to line it up) and remove the clear sheet. Place the tattoo face down on your skin and hold a wet cloth against it for about 30 seconds. Peel the paper aside then pat gently with the wet cloth. Tada! Be sure not to twist or stretch skin until the tattoo has had time to set (at least 10 minutes). Flash Tattoos look best after they have had an hour or two to set into the skin. Yes! But we think that they look pretty cool - Flash Tans! To remove your Flash Tattoo simply soak your skin in baby oil, olive oil or coconut oil for one minute then gently scrub off. Repeat as necessary. Apply lotion to moisturize and soothe the skin area. 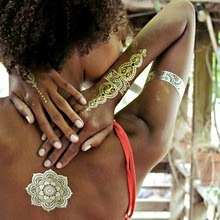 Flash Tattoos are shipped within 1 business day and may take up to a week to arrive for domestic orders. For international orders, It can take up to 15 business days or more to arrive. For more information about shipping costs and what countries we ship to, please see our shipping guidelines. Have you already tried Flash Tattoos? Will you be sporting them this Summer?